India’s fifth largest GSM Mobile Service operator AIRCEL today launched a dedicated 3G page on its website that will address subscribers’ queries and concerns regarding the next generation Mobile and Data services. The Aircel 3G page on its website gives an Overview of what this technology is and what it can do. It also provides information on Aircel 3G Zones established in Chennai, Hyderabad, Cochin, Coimbatore and Bangalore wherein one can explore the upcoming 3G mobile and data services with speed up to 21.1 Mbps. In 3G Spectrum Auction, AIRCEL emerged as the biggest spender which bagged 3G license for its strong hold areas and covers almost South and East region of the country. It has 3G spectrum in 13 circles – Andhra Pradesh, Karnataka,Tamil Nadu (including Chennai) Kerala , Punjab, U.P (East), Kolkata, West Bengal, Bihar & Jharkhand, Orissa, Assam, North East, and Jammu & Kashmir. As other private 3G service provider’s 3G Web page, Aircel also uploaded the FAQs related to 3G and has a section where subscribers can register for 3G services. The page also enables mobile phone users to check whether their Mobile Phone/Device is compatible with 3G. Aircel isn’t the first operator to create a 3G web-page, Tata Docomo, Bharti Airtel, Reliance Communications (RCOM) Idea Cellular and Vodafone Essar had already unveiled the 3G dedicated web-page on their websites. 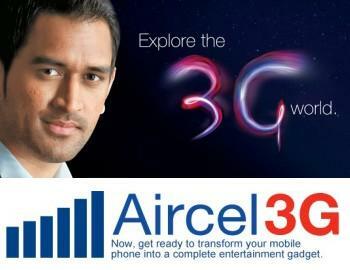 To get in more analysis on upcoming Aircel 3G, check out this link Aircel 3G Web Page.